This article outlines the top 4 qualities to look for in a pair of Muay Thai shorts, so you can get the most out of your fighting and training. Besides from gloves, pads and other protective gear, getting the best pair of Muay Thai shorts should be your top priority. Get a pair of Muay Thai shorts that look great! Let’s face it, a big part of choosing any clothing is how it looks. And that’s how many of the big Muay Thai brands differentiate themselves – on their design. Whether you’re going for Fairtex, Raja, Kombat or Twins, the designs are going to be one of the key factors. 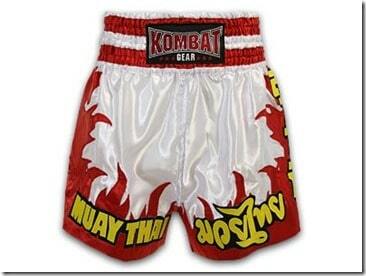 A great innovation in Muay Thai shorts, and kick boxing gear in general, are custom designs. For example, Kombat have a whole system available where you get to select your shorts style, your color, the graphics, the text, and then also the ‘poo’ which is the borders and trim on the sides. It’s definitely worth checking it out. As an aside, you can also make customized boxing trunks and k1 trunk. Even if you don’t want to go for a customized design, there are plenty of great pre-made designs to choose from. Whether you like black or gold, flames or authentic Thai lettering, you’re bound to find a design that suits your tastes. Here a few examples of some great designs out there. Flames are a popular design feature of muay thai shorts. Notice the thai lettering as well, which is another popular element which provide an air of authenticity. Check them out here, or by clicking the picture above. Similar to the other pair shown, this pair also has Thai lettering. Solid colors are a great choice, with the white waist band and blue body working well together. Whether you’re having a professional fight in a stadium or your training at the gym, you’re going to want shorts that offer you the maximum range of motion. When you’re kicking and kneeing you don’t want to be restricted by your shorts! In line with this, sizing is very important. Each brand tends to have slightly different sizing, so it’s important that you look at their own sizing guide before buying. The best Muay Thai shorts will also have several other important features for comfort and mobility. 1) Slits on the legs of the shorts. This will enable you to have a greater range of motion. Be sure to check for this as not all shorts have them. Notice the leg slits in the picture above, which provides greater mobility for leg movements. Click here or on the picture to purchase! 2) Smaller shorts. You may also want to go for a smaller/shorter pair of kick boxing shorts. You can see in this video of Mike Zambidis (or ‘Iron Mike’) that he’s wearing a shorter type of Muay Thai shorts than his opponent. 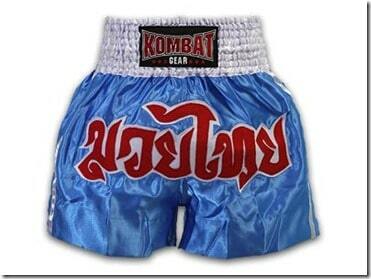 It may be more similar to a K-1 style of shorts than the traditional Muay Thai short. It’s a great match as well, so well worth watching! I won’t tell you who wins. 3) Light weight material. 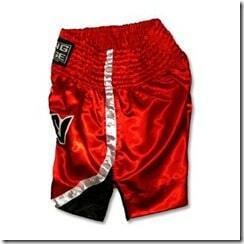 This is generally a given as almost all Thai kickboxing shorts are made from light weight satin. However, it’s still something to be aware of. 4) Wide short legs. This will further increase your mobility so you can exercise the range of kicks and moves needed for Muay Thai. 5) Elastic waistband. Again, this is pretty standard, but good to be aware of this feature. Having an elastic waistband is going to give you more flexibility in the sizing and will ensure that it will stay in place when you’re moving. You can see that all the pictures of Muay Thai shorts above have elastic waistbands. One of the biggest decisions you will need to make when purchasing a pair of kick boxing shorts is how much to spend versus what quality you get. There are many very cheap pairs of shorts out there, with mmastuff.com even having a whole listing of shorts for 10 dollars! Many people are happy with them. However, I’ve heard many stories where people buy cheap Muay Thai shorts and they rip on the first kick, they fall apart after just a couple of washes, or the threading gets stuck on the Velcro of their gloves. These are all results of low quality craftsmanship. At the end of the day, you get what you pay for when purchasing Muay Thai boxing shorts. Then again, there are some great sales around, so make sure you look around. MuayThaiStuff.com frequently has shorts up to 50-60% off, so you can get some very good quality shorts for cheap. The online market place for Muay Thai gear and equipment is only going to get more and more competitive, so expect to see some great prices in 2013! This is a pair of shorts for only $10. Muaythaistuff has some great value items with this one being discounted by 66%! Click here or on the picture above to check out further. So to wrap up, there are three major aspects to consider when purchasing a pair of Muay Thai shorts. 1) Look for a design that you love. There’s so many designs, colors, patterns and graphics out there that you might as well pick something that really appeals to you. Don’t forget the custom designs, too! 2) Make sure you buy shorts that have maximum mobility and comfort. Three simple things you can do to ensure optimal movement is to get shorts with lightweight (usually satin) fabric, make sure there are wide leg holes, and also ideally, look for something with a side slit, although that it not essential. Finally, make sure you check the sizing chart before you buy! It’s not fun when you buy a pair of shorts online and they don’t fit well! 3) Make sure you make the right trade-off between quality and price. There are a lot of very inexpensive or cheap Muay Thai shorts out there. However, they can be low quality, tearing or just falling apart quickly. Generally, you can go buy the rule that you get what you pay for. Though there are some great sales out there where you can get high quality Muay Thai shorts for a very low price. Next post: Cheap MMA Gear – We Review the Best Stores!